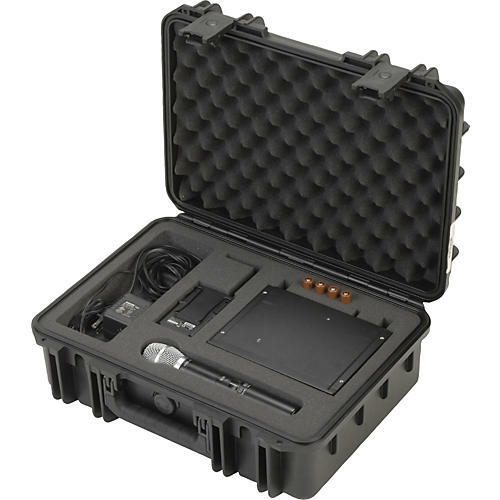 Based on the proven 3I Series design, this case was designed to hold SLX and ULX wireless systems. Interior foam can hold the receiver, quarter and half wave antennae, handheld mic, bodypack, lavalier mic, 9V and AA batteries, mic clip and power supply. Other wireless systems from other manufacturers MAY fit in this case, however, the foam is cut specifically for SLX and ULX wireless systems. 3I Series injection molded waterproof cases are constructed of ultra high-strength polypropylene copolymer resin and feature a waterproof and airtight, submersible design (IP67) that is resistant to corrosion and impact damage. Its continuous molded-in hinge, patent pending "trigger release" latch system, comfortable, snap-down rubber over-molded cushion grip handle, secure stacking, and automatic ambient pressure equalization valve (MIL-STD-648C) all contribute to its military grade design.